I've been deemed inhuman in some circles because of my non-fluency in the Jane Austen oeuvre. I know. I can't help it - even after my seventh grade English teacher reco'd Jane to me, I just couldn't get into her. I skipped Jane and jumped right into Loveswepts. But, my middle sister has a thing for Jane Austen. So I figured since she brought this back for me from Winchester, she'd be the best person to magnetblog it out. Joy's off having quality BFF time, so she asked some of us to pick from a selection of magnets to blog about. Well, of course I chose this one. I gave it to her! I've been to Jolly Olde England about five times now, starting with a high school band trip. I wonder if my parents had some kind of 19th-century "all girls must take a grand tour of Europe" philosophy because we all went to the Continent in high school. Anyway. Back then I had only a slight interest in Jane Austen. We'd seen the 1980 Pride & Prejudice adaptation in English class, I loved the chemistry between Elizabeth and Darcy, and I muddled my way through the book (still my fave ever). So you'd think I'd have known that Jane Austen was buried at Winchester Cathedral when I was, you know, at Winchester Cathedral way back in 1995 on that high school trip. But no. I was kind of distracted at the time (cute boys will do that to you), and so I totally missed that fact. So ever since then I've wanted to go back to Winchester. And since those halcyon days of high school, my love for Jane Austen has grown exponentially. A few years ago I re-read all her books in order of least familiar to most familiar (if you must know: Northanger Abbey, Persuasion, Mansfield Park, Emma, Sense & Sensibility, then finally P&P). Right afterward, I went on a Great Great Britain tour: two weeks of traveling through the country via train. LOVE. When planning the trip, I asked my friend: Do you want to see or do anything in particular? His reply: Not really. Left to my own devices, I scheduled us tons o' Jane Austen stuff! We went to Chawton Cottage, where she spent several years and saw the little table where she revised P&P and Sense & Sensibility and wrote Persuasion, Mansfield Park and Emma. Imagine: this woman all hunched over this tiny table laboring over these books that, during her lifetime, were published anonymously, described as being written "By a Lady." Today those same books are a veritable industry. Crazy! We went to Bath, where I succeeded in suppressing my squees at seeing the Pump Room and Milsom Street and Queen's Square (all associated with her books) and the Assembly Rooms (closed for a private event -- boo!). Then we got to the gravel walk where Anne and Capt. Wentworth reunited in Persuasion -- my second fave book -- and I couldn't hold it in anymore. Squeeee! People looked at me funny. An we went to Chatsworth, the Peak District home of the Duke/Duchess of Devonshire and the supposed inspiration for Darcy's Pemberley estate, though a few estates are said to have that same distinction. Chatsworth, y'all? Amazing. I mean, damn. It actually was Pemberley in the 2005 P&P movie with Keira Knightley, who incidentally returned to the home again to film scenes for The Duchess [as in Devonshire]. In a nod to Austenites like me, the estate's sculpture gallery still has the bust of Matthew Macfadyen that played a part in the P&P movie. Of course I have a picture with it. So go if you can. The ride on the bus there was cool too - lots of barren peaks and moors. So with all those Austen-y adventures planned, you'd think I went to Winchester on that trip, right? Wrong. 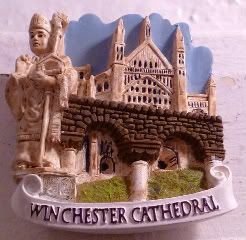 I was at Winchester a few months ago on my woman-on-her-own trip to London. Finally. We just couldn't fit the town into the Great Great Britain Tour or on any other visit to the U.K. I've taken in the past, oh, 15 years. It took an hour to get there and I spent about 30 minutes total in the cathedral and about 45 minutes at the gift shop, buying this magnet and a book examining the social context of Austen's novels. They have a few of her letters on display in the church and she has a memorial window, a marker inlaid in the floor plus a plaque on the wall. All in all it was very cool. Still, though, I think of all the places I visited, I still love Chawton the most, with its whole OMG-she-lived-in-this-very-house vibe. Anyway, I was going to include links and interesting facts about Jane Austen, such as she moved to Winchester in 1817, the year she died. But you know what? You only need to know one thing: Jane Austen kinda rules. I first saw this post on joy's FB page, and I saw that DCsis guestblogged, and I read the bit about how "I could never get into the Jane Austen oeuvre" (which, you know, made my heart die a little bit) but I was like, "WHAT?! DCSIS?!" all spluttery. And I actually said out loud, "But you coined the N&S term of "P&P: with cotton!" Then I read the whole post and was very, "Ohhhhhhhhhhhhhhh." and it all made sense. Hey - isn't Runnymede where they signed the Magna Carta or something? I remember us in a tour bus, and we stopped in some field, and they pointed out some lone stone in the brush and said, this is something very important. I could swear that was it. But who knows...probably Kate, since she was the only person on that bus I still keep in touch with...and probably paying better attention than I was.